World Superbike champion Jonathan Rea, who won the Cornmarket Irish Motorcyclist of the Year award for the fourth successive time, pictured with William Dunlops partner Janine and mum Louise. Jonathan Rea was crowned Cornmarket Irish Motorcyclist of the Year for a fourth consecutive time on Friday night in Belfast. The Northern Ireland rider received a standing ovation as he collected the prestigious accolade at the sold-out gala awards ceremony at the Crowne Plaza Hotel. Four-time World Superbike champion Jonathan Rea with the Cornmarket Irish Motorcyclist of the Year trophy. Rea equalled Carl Fogarty’s record of four World Superbike titles in 2018, although the 31-year-old is the only rider ever to win the championship more than twice in a row. The Ballyclare man is now gunning for an unprecedented fifth world crown this year, which would set Rea apart as the most successful rider in the history of the championship. He was an overwhelming favourite to clinch the top honour at Irish motorcycling’s ‘Oscars’ and Rea has now become the first rider to win the coveted trophy more than three times in succession. Previously, road racing legend Joey Dunlop won the trophy three times on the trot from 1983-1985. Clogher’s Keith Farmer, who won the British Superstock 1000 Championship last year, and British Supersport champion Jack Kennedy finished joint second overall in the Irish Motorcyclist of the Year category. On an emotional evening, William Dunlop was posthumously inducted into the RPS Group Hall of Fame. The award was collected by William’s partner, Janine, and mother, Louise. Peter Hickman was named the IFS International Road Racer of the year after a stellar season, with the Smiths Racing rider taking victories at the North West 200, Isle of Man TT, Ulster Grand Prix and Macau Grand Prix. Hickman won the award from Dean Harrison and Michael Dunlop. Triple Irish champion Derek McGee was the Belfast Telegraph National Road Racer of the Year, while the Cornmarket Outstanding Achievement gong went to Keith Farmer, who became a British champion last year for an incredible fourth time. Aghadowey’s Eunan McGlinchey was selected as the Kawasaki Young Rider of the Year. The 20-year-old won the British Junior Supersport Championship at his first attempt last year and is tipped for a big future in the sport. 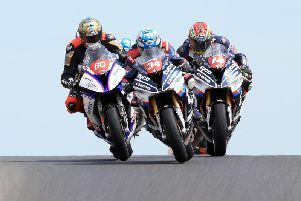 For the second year running, the North West 200 received the A. McLean Race of the Year accolade, with a dramatic second Supertwins race getting the nod after James Cowton snatched victory on the final lap, coming through from third place to pass Jeremy McWilliams and Joey Thompson.